one of the less severe forms of systemic scleroderma, consisting of calcinosis of the skin, raynaud's phenomenon, esophageal dysfunction, sclerodactyly, and telangiectasia. When esophageal dysfunction is not prominent, it is known as CRST syndrome. a variant of systemic sclerosis characterized by calcinosis, Raynaud phenomenon, esophageal motility disorders, sclerodactyly, and telangiectasia. abbreviation for calcinosis, Raynaud's phenomenon, esophageal dysfunction, sclerodactyly, and telangiectasis. CREST syndrome is a disease of skin and blood vessels and, in severe cases, the lungs, digestive tract, or heart. To be diagnosed with CREST, an individual must display at least two of the five symptoms. 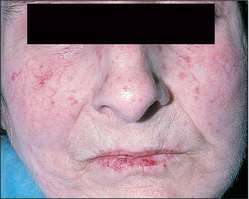 It is often associated with scleroderma. An acronymic designation for a variant of scleroderma characterized by calcinosis, Raynaud phenomenon, esophageal motility disorders, sclerodactyly, and telangiectasia. Acronym for a connective tissue disorder, related to progressive systemic sclerosis, but limited to CALCINOSIS, RAYNAUD'S PHENOMENON, oesophageal involvement, hardness of the fingers (Sclerodactyly) and dilated skin blood vessels (TELANGIECTASIA). The word forming the third letter of the acronym is spelt ‘esophageal’ in the USA. Acronym for variant of systemic sclerosis characterized by calcinosis, Raynaud phenomenon, esophageal motility disorders, sclerodactyly, and telangiectasia. Moreover, the serologic confirmation of CREST syndrome in a patient without any digestive symptoms could have masked the presence of the gastric malignancy. It is important to be aware that CREST syndrome and autoimmune thyroiditis can coexist and a thorough evaluation of both conditions and gastric cancer screening may be necessary even in patients who do not complain with digestive symptoms. Small lymphocytic lymphoma in a patient with CREST syndrome. Partial breast irradiation in a patient with bilateral breast cancers and CREST syndrome.